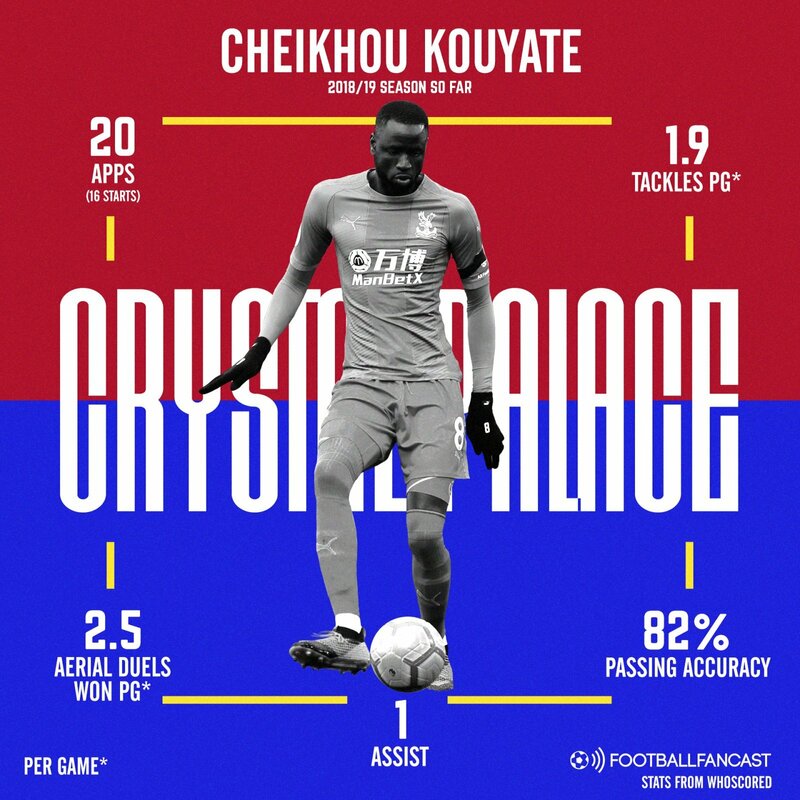 Since arriving at Crystal Palace from West Ham back in the summer (BBC), Cheikhou Kouyate has been a key figure in the Eagles’ midfield alongside James McArthur and Luka Milivojevic. The Selhurst Park faithful have warmed to the Senegalese international, as he always gives 100 per cent and is an extremely likeable figure around the club with his positive nature and energy. They may, however, have overlooked just how big an impact he has made in south London, as his arrival came almost immediately after French international Yohan Cabaye departed the club at the expiry of his contract. Cabaye offered composure, calmness and authority in the middle of the park alongside Milivojevic last season, but his contract was not renewed – this may have been down to his fitness, as the former Lille man rarely managed to complete 90 minutes last season as he hit 33 years of age. In stark contrast, Kouyate offers a robust, pragmatic approach alongside two midfielders in McArthur and Milivojevic who are also quite industrial, although perhaps slightly better on the ball. Having said all of that, it is unfair to judge Kouyate on circumstances out of his control, so let’s take a look at his first six months in SE25 in isolation. The former Anderlecht man has impressed the fans with his tireless running, and knack of always being in the right place at the right time to nick the ball away from the opposition either with his head or his feet. Kouyate has kept things tidy in the middle of the park, averaging a pass success rate of 82 per cent (per Whoscored) throughout his 20 Premier League appearances so far this season, whilst also picking up an assist along the way. His aerial duel success rate of 2.5 won per game only further emphasises just how important he is from a defensive aspect, often snuffing out danger and being there to head clear time and time again. His 1.9 tackles per game also demonstrate his selflessness in doing the dirty work for his teammates, winning possession back for them almost twice a game. Overall, Kouyate has to be regarded as a good bit of business. At 29-years-old, he is perhaps in his peak as a ball-winning midfielder, and as N’Golo Kante and Fernandinho have proved time and time again, that position on the field is pivotal to any side’s chances of success. Additionally, for an initial fee of £9.5m (as per the Guardian), you can’t really argue with the fact that the former Hammer has been exceptional value for money in the modern day market.